Looking over the audience of 700 and listening to a panel of state and federal elected officials during the Delta Water Summit in Fresno State’s Satellite Student Union is Mario Santoyo (left), Friant Water Authority Assistant General Manager and California Latino Water Coalition Executive Director. Santoyo was among the event’s principal organizers. 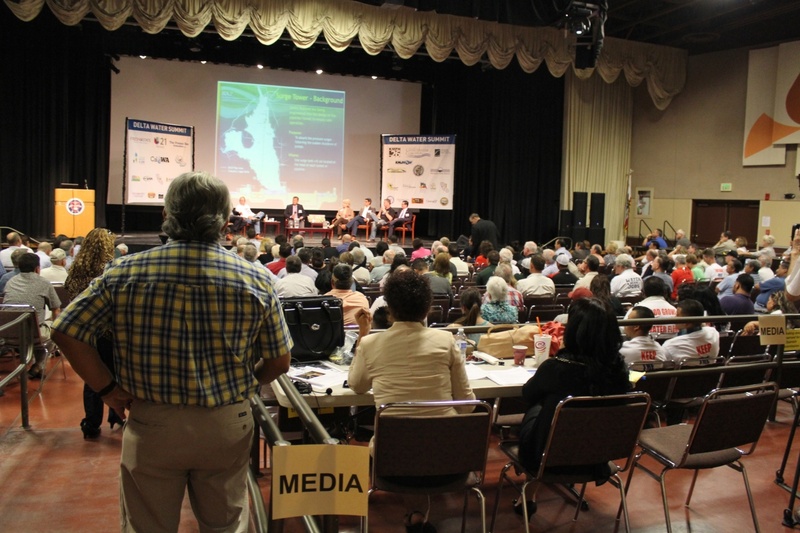 There are all sorts of issues and problems surrounding the troubled Sacramento-San Joaquin Bay-Delta Estuary but one speaker after another – and quite a few in the Delta Water Summit audience of 700 – focused on the need for more water, including a water bond that includes above-ground storage. An audience of 700 attended the August 3 event at California State University, Fresno’s Satellite Student Union and frequently applauded comments (or made their own in lieu of asking questions) about problems and possible resolutions of the valley’s water supply shortfall, much of which is directly related to Delta water export supply restrictions in place to protect endangered species. One major potential but highly controversial remedy is the Bay-Delta Conservation Plan and a proposal to build a 30-mile twin-water conveyance tunnel system to bypass the Delta and its fragile environment and infrastructure. Although it was discussed at length, there seemed to be more interest in developing new water storage. Dr. Gerald Meral, State Deputy Resources Director, views the site of the proposed Temperance Flat Dam in upper Millerton Lake. Dr. Gerald Meral, the state’s Deputy Resources Secretary, presented an overview of the BDCP. 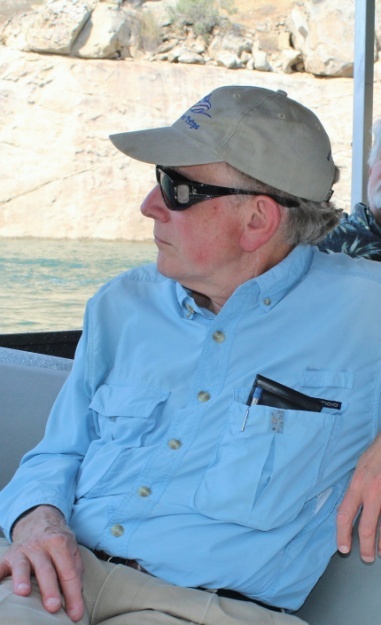 “The idea was to develop a plan to meet the needs of the species, the Endangered Species Act and water users,” he said. However, Meral arrived in Fresno a day early to join Friant Water Authority, U.S. Bureau of Reclamation and other officials on a Millerton Lake State Park informational boat tour to the proposed site of Temperance Flat Dam, about four miles upstream from Friant Dam. Assembly Member Henry T. Perea (D-Fresno), was among those stressing that he wants the water bond that is now in the process of being legislatively recrafted to contain money for surface storage as well as Delta fixes and water quality solutions. Friant Water Authority General Manager Ronald D. Jacobsma explained why new surface storage, such as the proposed Temperance Flat Reservoir, is so vital to the region’s overall water supply. Jacobsma added, “The problem is that the low hanging fruit has already been built. We manage 1.8 million acre feet more with a 520,000-acre foot reservoir. So what we’re looking at doing is how to pull additional yield out of that project. “If you build a million plus acre feet reservoir [Temperance Flat is proposed to be 1.2 million acre-feet], the yield is about 150,000 acre feet. That is a key water supply. That’s about what we’re committing to the environment through our Restoration Program, or soon will be. If you take $2-3 billion off that cost for agriculture, it just doesn’t work by itself. But if you can get the Delta reliability back so when we’re moving vast amounts of wet year water, it would run out of storage south of the Delta. Thomas Birmingham, General Manager of the Westlands Water District, pointed out that growers, farm workers, entire communities and numerous businesses have and continued to suffer from Delta water curtailments under the Endangered Species Act. “You wind up putting people in a food line to protect a fish [the Delta smelt] no bigger than my little finger,” he said. Birmingham said Central Valley Project and State Water Project development and operations have helped the Delta, where the twin tunnels would be built and where opposition to the BDCP is fierce, by helping repulse salt water intrusion and otherwise improve water quality. He said the Legislature in 2009, by enacting the Delta Reform Act in 2009, decreed that enough water is to be provided to reasonable and beneficial use needs. “That is a concept of adequacy that a lot of people want to ignore,” Birmingham said. Brent Walthall, Kern County Water Agency Assistant General Manager, said that stressors other than Delta pumping are a problem. Sunne McPeak of the Delta Vision Foundation and a key opponent said she helped defeat the Peripheral Canal in 1982 because it lacked commitment to build new surface water storage facilities. “If we do not have the guts and commitment to build facilities to store that surplus [from flood events] … then shame on us.” McPeak said that inaction is placing a $2 trillion California economy at risk. Rep. Jim Costa (D-Fresno) said, “We absolutely have to come together” on water. He said legislation is needed to create water reliability but to achieve it political support must be built in Southern California and the Bay Area. Chris Acree, Executive Director of Revive the San Joaquin and the environmental community representative on the program, contended that “pumping has increased all the way through the 1980s until today. In 1992, the State Board said there were safe Delta levels of fresh water at about 2.5-3 million acre feet a year of exports. We’re already up to 5-10 million acre-feet.